Summary: Can You Name It? 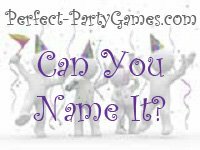 is a game where you have to list all the types of "cans" through the use of clues. Print one copy of Can You Name It? for each player. Allow 5 minutes for the players to correctly guess the word that begins with "can" in the clues.